Halloween Party Decoration, Haunted House, Mansion, Castle Entry, Vampire Witch Scenery, or Dining Room Decor, as pictured. Gothic Decor Damask Brocade Fabric Red SQUARE PILLOW COVER Christmas Holiday Halloween Decor- as pictured. Complete your Halloween or cosplay costume party with elegant, dramatic and spooky living room, family room, entry, den decorations! 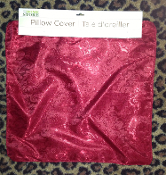 This pillow cover will add a rich sophistication to any home. A true red color with a swirly floral design damask-style pattern. Very elegant with a hint of floral and paisley designs on the material. Silky polyester fabric with a slight sheen. A nice way to add class and style to any house, haunted or otherwise. Pillow cover only. Does NOT include insert or stuffing. Please view photos carefully. Machine wash cold, gentle cycle. Use only non-chlorine bleach when needed. Tumble dry low heat. Cool iron as needed. Elegant spooky additions for haunted house, mansion and castle scenery or party decor. Attractive and formal look for home or office. New Red Throw Pillow Cover Damask Fabric square shell pillow cover with nice narrow cord around the edge and 10-inch zipper on one side to slip pillow in. *See our matching Window Valance, Round Table Topper, Table Runner, to complete the set!! !